Ian David Kitson died in Johannesburg on 9 November 2010 at the age of 91. Although he played no direct role in the formation of the City of London Anti-Apartheid Group, it is possible to argue that without him the group might never have come into existence. His principled refusal to disown the group that his wife, Norma, and children, Steven and Amandla, had helped to found was to cost him dearly. 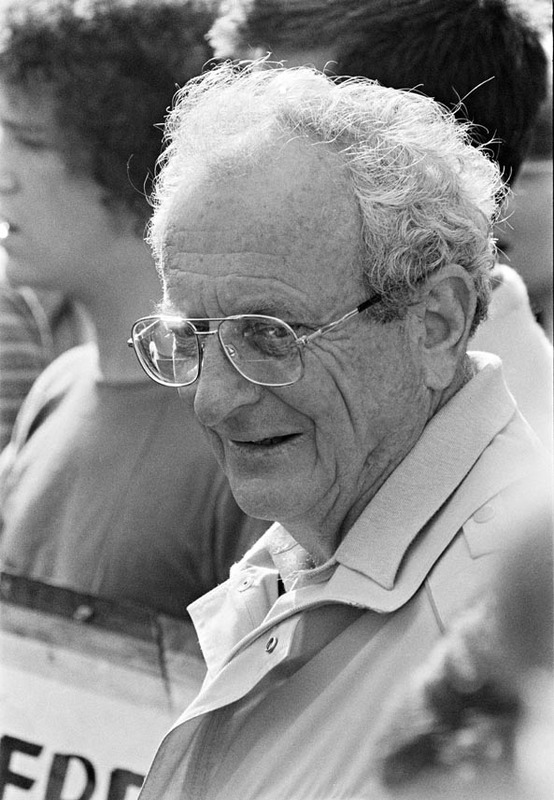 David was a member of the South African Communist Party and became the longest-serving white political prisoner in South Africa under apartheid. He played a crucial role in the early days of the armed struggle against apartheid in the early 1960s, acting as a bomb-instructor for Umkhonto we Sizwe (MK) when it was formed in December 1961. When almost the entire leadership of MK was arrested at Rivonia in July 1963, David was propelled into the four-strong replacement High Command of the organisation. He served a little more than four months in this role before he too was arrested. At his subsequent trial he was jailed for twenty years for sabotage and membership of the Communist Party. He served almost the full-term; eventually being released in May 1984. How David ended up in this position is about more than just his politics. David studied mechanical engineering in Durban in the 1940s. Upon graduation, he served as a sapper in the South African army, thereby learning to apply his training as an engineer in ways that would later benefit the anti-apartheid struggle. At the end of WWII, David moved to London, where his father had been born. There he worked as a draughtsman for de Havilland Aircraft. He played an active role in the engineering union TASS and became Secretary of the Hornsey branch of the Communist Party. His union sponsored him to study at Ruskin College, Oxford for two years. Whilst in London, David met and married Norma Cranko, a fellow South African who had been active in the Congress of Democrats, the white wing of the ANC-led Congress Alliance. Norma was in London preparing to participate in the 1955 Warsaw Youth Festival as part of the South African delegation (of ANC and SACP supporters). There Norma also joined the Communist Party. Following the birth of their son, Steven, they returned to South Africa in June 1959. Publicly, they returned to introduce to Steven to his grandparents and to raise him as a South African; but the length of their respective absences from the country meant that they were a valuable asset to the anti-apartheid struggle and both Norma and David were instructed to join the emerging underground cell structures of Congress and the SACP. Norma and David returned to South Africa and an active role in the struggle just as many other progressive whites were leaving the country. Although David was a Communist Party loyalist, he did not uncritically tow the ‘party line’. In particular, David had developed an ‘anti-imperialist’ perspective on the role of South African revolutionaries and did not support the ‘stagist’ strategy of the SACP. He did not believe that a national democratic revolution should be prioritized over and ahead of a socialist one. Taken together, these two expressions of ‘going against the flow’ provoked tensions between the Kitsons and their comrades, and were to have consequences for them years later. Following David’s arrest, Norma was also detained for a period and endured persistent harassment from the police for as long as she remained in South Africa. In 1966 Norma decided to move Steven and Amandla to London. There she was largely shunned by the exiled ANC and SACP community for many years; but enjoyed support and friendship from many people she and David had known during their time in the Hornsey Branch of the Communist Party. Some of these people – Mary and Henry Barnett, Lena and Arthur Prior, and Rene Waller – would later become stalwarts of the City of London Anti-Apartheid Group (and, later still, the Justice for Kitson Campaign). In London, Norma divorced David, with his support, and married Sidney Cherfas, a fellow South Africa – although Norma and David remarried following his release from gaol. In 1979, three political prisoners escaped from Pretoria Local prison. In punishment, the authorities moved the other white political prisoners to death row. In the poor conditions of death row, David’s health deteriorated rapidly, and the family became increasingly concerned about his well-being. In this context, Steven travelled to South Africa, in January 1982, to visit his father and was detained for six days by the South African authorities. Norma and her friends and colleagues hastily convened a campaign calling for his release and, out of the Free Steve Kitson Campaign, the City of London Anti-Apartheid Group was formed in early 1982. Members of the Revolutionary Communist Group played a crucial role in the formation of City Group. 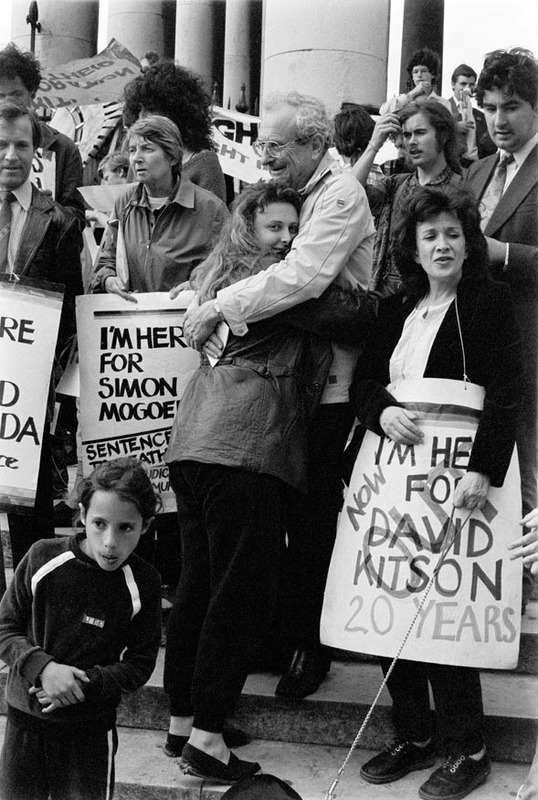 On 25 August 1982, David’s 63rd birthday, City Group launched a non-stop picket of the South African embassy demanding that the prisoners be moved to better conditions (and, ultimately, released). It lasted for 86 days, ending in partial victory. As has been well-documented on this blog, City Group’s confrontational approach to anti-apartheid campaigning won few friends amongst the exiled ANC members in London and their supporters in the British Anti-Apartheid Movement. When David arrived in London following his release in May 1984 the SACP instructed him to denounce Norma and call for City Group to be disbanded. He, of course, refused. By November 1984, both Norma and David had been expelled from the SACP and suspended from the ANC (although, as David was fond of pointing out, with slight bemusement, he had always been a member of the SACP, not the ANC). The long-standing offer of a ‘job for life’, funded by his union TASS, at Ruskin College was then quickly withdrawn (when the union’s Stalinist leadership acquiesced to pressure from the SACP). Norma and David always maintained that there was a deeper politics to their treatment: that David’s release, after twenty years, was a threat to those white SACP and ANC members who had fled South Africa (against the instructions of the SACP Central Committee) while he was still working in the underground. That he had long-standing political differences with Joe Slovo and others over revolutionary strategy was further fuel for this conflict. These political differences were real, but they were also manipulated by South African Military Intelligence at the time – the two ANC leaders who suspended the Kitsons, Solly Smith and Francis Meli, were both later revealed to have been South African agents. Through City Group and the Justice for Kitson Campaign, David fought hard to clear his name, but with few victories. Following their release from gaol, Nelson Mandela and Walter Sisulu called for the suspension of the Kitsons from the ANC was lifted in the early 1990s, but David and Norma were never incorporated back into ANC structures and politics. They moved to Harare in the late 1980s, where Norma died in 2002. Throughout his time back in southern Africa, David continued to correspond with his supporters in Britain and wrote regularly to the letters pages of the British Left press offering critical analysis of events in the new South Africa. This entry was posted in Archival research and tagged Amandla Kitson, ANC, City of London Anti-Apartheid Group, David Kitson, Norma Kitson, Ruskin College, SACP, Solly Smith, Steve Kitson, TASS, Umkhonto we Siswe. Bookmark the permalink. I have said it before, and I’ll probably say it again, I have never met a man I admire more than David. I am not a Communist, but I admire so much of the values of my many “Commie” comrades, not least of which are the members of the RCG who were so integral to the NSP. And again, I will always remember David’s words to us all, that when apartheid ended we would have to fight even harder for the rights of the working class in SA. Kind of mirrors what’s going on in Palestine now and it humbles me in the fact that I feel so impotent politically to affect any change. David would have been there right in the middle of Gaza attempting to affect that change. I was around 13 when I first heard of David Kitson and could not find any information on him. I was always amazed that a white South African would be against apartheid. I am now 68 and his name just came into my mind and I decided to Google him. God rest his soul and may more people learn of this just man. I was about 13 when my brother and I stumbled on the anti apartheid demonstration outside SA house. We became good friends with the Kitson Family, Norma, Steven and Amandela. They were all inspirational people that help shape my values.